This outrage over Kerala House over #BeefRaid issue is plain drama. Let me debunk this drama thoroughly but before proceeding on facts, let me constitutionally define Secularism to all secular brigade as the basic premise. Delhi Police received a call from some ‘Vishnu Gupta’ (later found to be Hindu-Sena Activist) that beef are being served in the Kerela House and if not intervened, they are going to protest. Given the recent history, Full marks to Delhi police for Kerala House response in investigating beef compliant, take action against complainant if false. Why can’t people understand that law applies to everyone. All who break it must be tried, convicted & punished by the State. No ifs, No buts. Delhi Police simply followed the mandate of Delhi Agricultural Cattle Preservation Act, 1994 enacted by previous Delhi Govt. of Congress. But no. Our outrage industry got a chance to blabber on #BeefBan and growing intolerance. In no time they were joined by the chief of all Nautanki Mr Kejriwal with his abominable behavior. Kejriwal Increasingly proving it evry passing day that he has zero responsibility, no conviction & stands for nothing, but all drama. If the Chief Minister of the State has no clue about the law of the state he is governing, God save Delhi. Before blaming PM Modi for Kerala House raid, Arvind Kejriwal should read DACP ACT, 1994 of Delhi. Read the facts about ban on slaughter, sale, possession of agricultural cattle in Delhi. Read the definition of Agricultural Cattle under DACP Act, 1994 which includes cows & calves, bulls and bullocks of all ages. 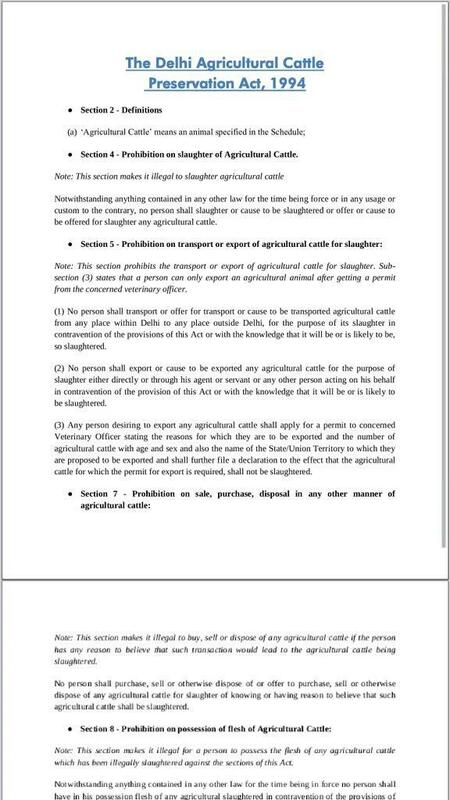 DACP Act, 1994 also bans transport and export of agricultural cattle in NCT of Delhi for the purposes of slaughter. 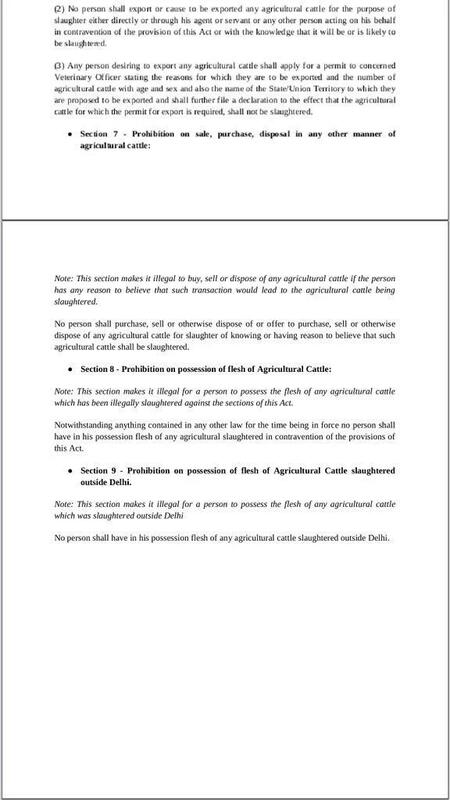 DACP Act, 1994 also bans sale, purchase, disposal & even possession of flesh of agricultural cattle in NCT of Delhi. In view of Sec. 7, 8 & 9 of DACP Act 1994, the alleged activities at Kerala House appear to be patently illegal. Contravention of Sec. 4, 5, 7, 8 & 9 of DACP Act, 1994 amounts to a crime, that attracts imprisonment & fine. I had no clue that the Kerala Bhawan is Embassy of Kerala in Delhi, with full diplomatic immunity and out of bounds for police enforcing the Law. I don’t support a selective application of Law with reference to any group or community, for or against. That is the law of the land, the basic premise of secularism suggests exactly the same. How is one group identity of a victim or criminal relevant? We can’t have a special law & special approach to law, for every group we, (dis)favor. If we don’t have laws against “hate crimes” or the laws are inadequate, then work for legal reform & support their uniform application. But the ‘Constitution’ can go to hell, Modi is fascist and since he became PM, the intolerance temperature is growing and this is our last attempt to come back to power. Huh! In India today, principles are subjective. Had this happened under BJP rule, “Radical Hindu forces shame India internationally” would have been the headline. 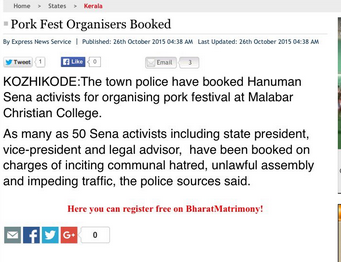 I thought Shashi Tharoor’s home state, the Kingdom of Mallu-Land is most liberal and they will fully support Pork Festival. But look at the level of intolerance in Congress-ruled state, that they booked 50 activists for eating a dirty animals meat. That is not the only case. 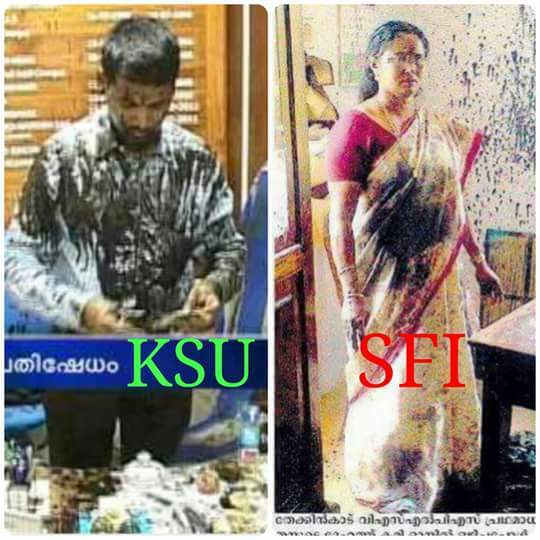 When an IAS officer & a teacher were painted black by KSU & SFI gangsters – no hue & cry in #Kerala. Thus, ink on Kulkarni is intolerance. Ink on others democratic dissent. Increasing selectivity and subjectivity of a certain section is a good thing in my opinion. It exposes them for who they are & their hollowness rings loud. In my opinion, there is No point in creating noise by blaming cops for implementing a legal rule. Put your money where your mouth is. Push for the right to eat beef including agricultural cattle. There has to be a limit to deception. I urge Arvind Kejriwal, Brinda Karat, CPI, Indian National Congress, Main Stream Media, Social activists, and ” intellectuals” to push for a change of law & allow cow slaughter. Go, dear Delhi CM, you have all the power, the unprecedented mandate of 67 out of 70 MLAS in Delhi. 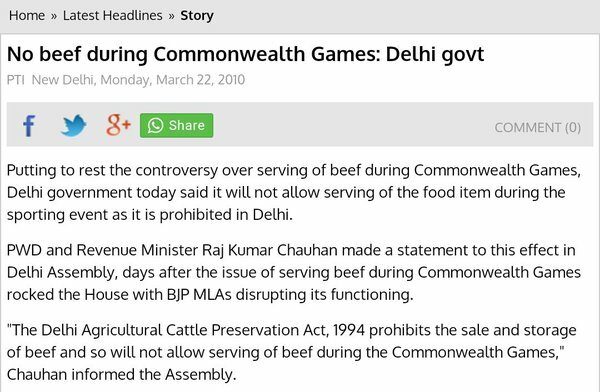 Repeal the #Beefban law brought by Congress and Walk the talk! The jokers would run away. 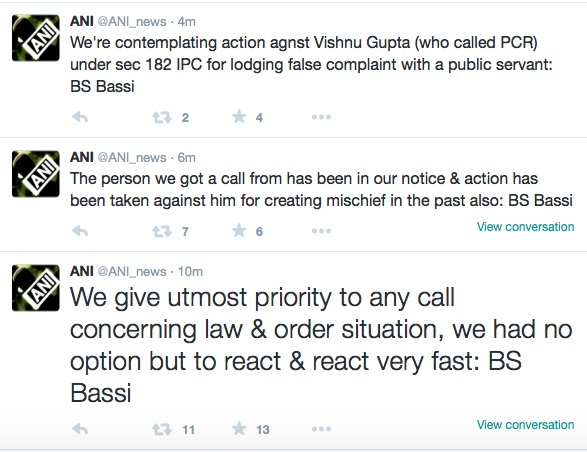 Now some bad news for the outrage industry who were trying to link this to BJP and Modi. 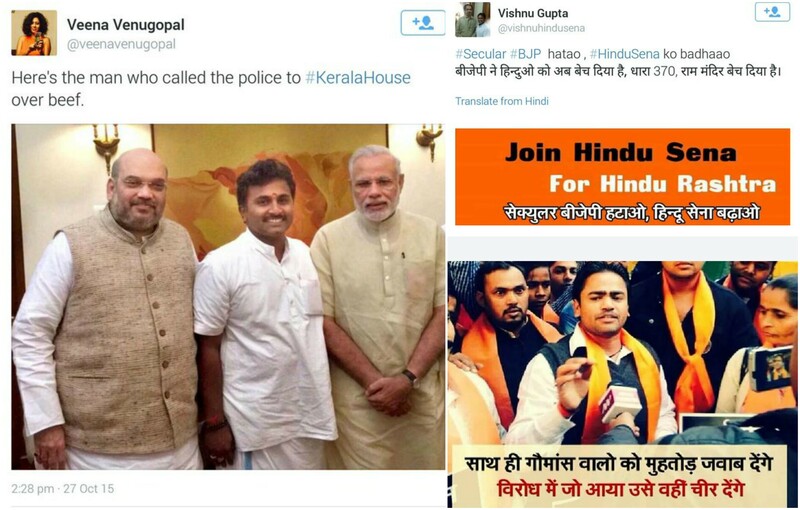 Senior journalist Veena Venugopal used someone else’s picture to link Vishnu Gupta, the Ram Sena radical who called cops to Kerela House, to Modi & Shah. They didn’t know that this guy is a proven BJP hater and has been detained now by Delhi Police. I conclude with my $00.02 to all the Adarsh Liberals. Friends, this is not working, please try something else. I thank my friend @smitabarooah for some clarity through her tweets and @BhateKetan as the source of some pictures posted here.